Buying a sewing machine can be an overwhelming and confusing process. There are so many different makes, models and price points. It can be very difficult to narrow all these choices down. In this article we will explore the computerized sewing machine. Who they are for, common problems, prices and even take an in depth look into my top 5 computerized sewing machines. I hope this post helps you decide what machine is right for you! What Are the Benefits of a Computerized Sewing Machine? Why Use a Computerized Sewing Machine? Can You Get Different Types of Computerized Sewing Machines? What Are the Common Problems of a Computerized Sewing Machine? What Is the Price of a Computerized Sewing Machine? One of the biggest benefits when it comes to using a computerized sewing machine is that you only need to invest a small amount of time to create something phenomenal and professional over and over again. So long as you’ve got the basics down and you can thread your own machine, you are more than ready to start your sewing adventure. Yet another upside to using a computerized sewing machine is that it can easily create amazing works and you can create a more consistent end result. When you’re attempting to do it all with a manual sewing machine, you can have changes in how you feed the material to the foot and different variations in your thread tension. With a computerized sewing machine that offers automatic features, a lot of these issues go away. When it comes to what sewing machine works best for you it really comes down to what you want to use it for. When you use a computerized sewing machine it can be extremely useful, but there is more to it than just controlling the thread tension or turning stitching on to autopilot mode. Now if you happen to love doing embroidery work and want a computerized sewing machine, you’ve got quite a few options that can handle your love for embroidery. A lot of patterns can be downloaded from the internet and some machines even let you customize your embroidery with your own designs. It enables you to create something that fits your personality and project, and it’s super easy. Today a lot of the best and most popular sewing machines come with different training materials for beginning sewers who want to learn but haven’t used a machine before, this helps them to start shaping their skills on computerized sewing machines right off the bat. There are some makes and models that even have a tutorial built-in to the machine’s data so that those wanting to can learn quickly and safely. With all of these different makes and models with their various functions, it could be hard for you to decide what you should get for your needs. That is where this review of some of the best computerized sewing machines comes in. With these computerized sewing machine reviews and thoughts, you can make your decision without so much stress and worrying over if you are getting what you need. The selection process becomes simpler as you get to look at your options altogether and compare them before you look at them. Computerized sewing machines can be great for many reasons. One of the best things about them is how easy they are to use. They can feature quite a few things that a manual sewing machine doesn’t, such as powerful feed doges, auto-stitch tension, auto-needle threading, and auto-reverse. Something you should always keep in mind when deciding what sewing machine to start someone out on is who you’re deciding it for. If they are easily overwhelmed or very young then it would probably be in their best interest to start them out on a manual sewing machine. Below are some options of computerized sewing machines that I’ve looked into. As there are so many different options with their own features and downsides, finding the right one can be a pretty big process. So, here I’ve sorted and broken them down to make it just a little bit simpler. High User Rating: The Janome 8077 has a 97.50% rating which is higher than some of its competitors, especially you consider its capabilities. Auto Thread: It also features an auto-threader which can easily adjust the length and width with just a touch of the button. Workspace Lights: There’s a bright two-digit LED screen that enables simple stitch selection along with a superior feeding system and drop feed capabilities. Easy Start/Stop: The Janome 8077 also features a start-stop button that allows the user to sew without a foot control or peddle. Built-In Stitches: This model also has 30 different built-in sewing stitches to choose from by using the front stitch panel and LED screen. The Janome 8077 is an impeccable moderate machine that is light, compact and runs calmly. It has 30 stitches and 6 buttonholes. This machine satisfies Janome’s notoriety of value. This sewing machine has enough features to enable you to develop, yet not too many to frustrate and confuse you. It isn’t only for the transitional sewers either; a beginning sewer could develop on this machine due to its convenience. The 8077 is another decent computerized sewing machine that you truly can’t make a bad decision in getting. In the event that you don’t need a huge number of extravagant accessories or fastens and convenience is critical to you then this machine is a brilliant decision. Standard Features: The Singer Futura XL400 features 30 different sewing stitches built in along with two one-step buttonholes that are fully automatic and 125 embroidery designs and five fonts and outline lettering built in. Workspace Lights: This option offers multiple different LED lighting options to reduce strain on your eyes when sewing and to make your work easier to see. Automatic Threader: An automatic needle threader is included in this model. All you have to do is thread your needle from the spool and press the appropriate lever. Embroidery: With this model of computerized sewing machine you also get a customizable embroidery system on your computer screen to allow for personalized designs. Warranty: This Singer Futura XL400 comes with a warranty that spans 25 years just in case something happens and you need a replacement. The Singer Futura XL400 seems to be a pretty simple and easy to use computerized sewing machine for individuals that reside in the United States or Canada, I wouldn’t recommend anyone outside of those areas to buy this model. It comes with quite a few great features such as the automatic stitching and the embroidery designs already programmed in. You can even hook this model up to a computer and transfer from your computer to your sewing machine. It is very easy to set up and use for anyone. This computerized sewing machine is especially great for anyone that adores embroidery and plans to use it a lot. You get a great option at an amazing value! Built-In Stitches: The Brother XR9500PRW comes with 100 decretive and heirloom stitches that are built in, each of which has their own unique stitch function. Additional Decorative Stitches: This model also comes with pre-programmed decorative stitches that are very wide zig-zag stitches. They are approximately 7mm stitches. Easy Monogramming: Another great feature with this option is the built-in sewing font, it allows for easy monogramming and personalization in your work. Extra Wide Table: With the Brother XR9500PRW you get an extra-wide table for your quilting needs and other large sewing projects, it even includes a hard cover for your computerized sewing machine. Storage: There is a compartment for storing of the included accessories located in the arm of the machine that is easily accessible. The Brother XR9500PRW seems to be a great sewing machine but I feel it’s better for more advanced sewers. With all of its different options it may overwhelm a beginning sewer. Its storage space is a great added benefit for those that like to keep their sewing supplies organized and together. With all of the different features in this model you are getting a great computerized sewing machine without spending too much. With all of its different features it is especially great for those wanting to make personalized projects with their sewing skills. High User Rating: The Janome 7330 has a 95.7% rating overall and is a great machine for both beginners and sewers that already know what they are doing. Button Hole Options: This model has 6 different one step sensor style button holes that really come in handy for any kind of project you might be working on. 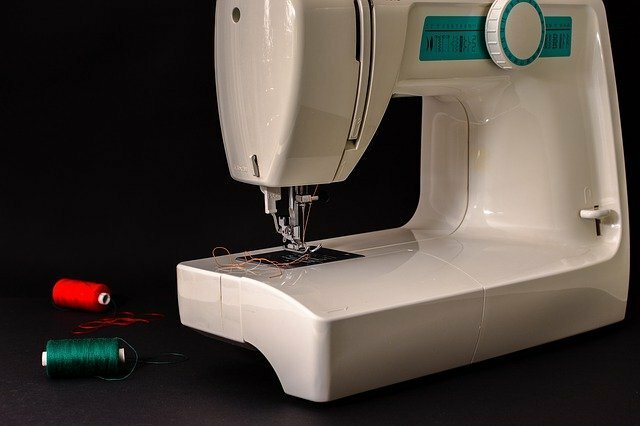 Foot Free Sewing: This option also happens to feature a memorized needle start and stop button that allows you to sew without using a foot pedal. LED Light: The amazing LED display will allow you to see and choose your machine settings with ease and take out just a little bit of stress. Needle Threader: The Janome 7330 has a built-in needle threader to allow ease on your part while working on any project that you have going. The Janome 7330 Magnolia is a stage up from the 8077 evaluated before and is the most progressive sewing machine in Janome’s Magnolia line. The Magnolia line is an awesome arrangement of machines, made for novices that are famous and are high caliber. This machine is unquestionably an awesome choice for beginners, yet it is such an intense, quick and dependable machine that it is appropriate for moderate sewers too. It is likewise an extremely lovely machine that will make sure to grab your attention with its assortment of features such as the 6 different one step sensor style buttonholes. This is a stunning middle range sewing machine that you will make sure to cherish. It is a great price for a basic sewing machine with the options that it has. Lightweight: The Juki HZL F600 is actually a pretty light computerized sewing machine, it clocks in at just over 20 pounds. Thread Tension: Due to the machines stable thread tension you are able to use free motion sewing with this particular model. Tough Machine: It is an industrial strength sewing machine and can handle even the thickest of fabrics and handles in a consistent manner. Large Sewing Space: This model has a wider sewing space that enables you to work on large projects with its extended tablespace. Box Feed Technology: With this machine you get box feed technology that helps you to be able to start and finish your sewing projects with ease and reduced stress. The Juki HZL F600 seems to be one of the more advanced and industrial strength computerized sewing machines available today. It’s ability to handle both heavy thick materials and lighter materials makes it great for bigger heavier projects or simple jobs. This machine is definitely one that I would recommend for someone that already knows what they are doing, that being said a beginner could also use the machine so long as they aren’t easily overwhelmed. The extended sewing table is probably one of my favorite features on this machine. It is a great value for one of the better of computerized sewing machines that are available. Today just about every sewing machine is in some way computerized. The computerized aspect is generally found within automatic threading, thread tension, or speed control. They are also some of the things that many sewers seem to struggle with, especially as beginners. Having automatic computerized features helps to make sewing less stressful and complicated while adding more fun into the mix. Now if you’re already able to handle sewing and machines and want to step up your game, then you may be ready for some of the other automatic features that computerized sewing machines can provide. Some of these functions include programmable monogramming, stitch patterns, and embroidery patterns. If it’s something that interests you can also set up some makes and models to create automatically rolled hems, seams, and some other various sewing chores that you need to get done. If you’re looking to get a model that is top-of-the-line, then chances are, you will get everything automatic. That leaves you to simply select your preferred stitching and pattern, then install your spool or bobbin, control your speed as desired and create! Now, with a computerized sewing machine, you need to be aware that one of the biggest issues that occurs with them is that they are indeed vulnerable to issues involving software. Your computerized sewing machine can easily turn into one big paperweight if there is even a single bad file in your firmware update. There is also a vulnerability which can occur when using a USB flash stick to download or directly copy pattern files to the machine. This is not necessarily a fault of the computerized sewing machine but something to keep in mind. When it comes to picking out a sewing machine, most people have a budget that they’d like to stick to, so it is important to know what you’re getting for your money. If you’re just looking for the basics when it comes to computerized sewing machines and only needs a couple of features then you can more than likely find the right one for under $200. However, if you are looking to get the top-of-the-line with all of the automatic features then you’ll more than likely end up paying thousands for it. Most sewers that want to get more than one or two features but aren’t looking to spend a tone on them should expect to pay around $500. You can even go a little higher than that and get more customization for your machine, or if you don’t want to go that high then you should keep in mind that you can still get customization, but you’ll be doing it all by hand rather than by the computerized sewing machine. Sewingstreak.com is a participant in the Amazon Services LLC Associates Program, an affiliate advertising program designed to provide a means for sites to earn advertising fees by advertising and linking to Amazon.com. Additionally, Sewingstreak.com participates in various other affiliate programs, and we sometimes get a commission through purchases made through our links. Copyright text 2019 by Sewing Streak.